The Tantric Grounds and Paths of the General System of Highest Yoga Tantra (based on Guhyasamaja). In order to be of maximum benefit to others, Buddha revealed both the common and uncommon paths to full enlightenment. The common path of sutra, as embodied in the lam-rim teachings, serves as the basis for the uncommon path of tantra, capable of guiding qualified practitioners to enlightenment in even one short lifetime. Following Ngawang Pelden's text on The Tantric Grounds and Paths, the most venerable Kirti Tsenshab Rinpoche presents a comprehensive explanation of the various elements making up the lightning vehicle of tantra. His teachings include an explanation of the three lower tantras as well as a more detailed explanation of the two stages of highest yoga tantra, the most profound of all four levels of tantric practice. "In the past, the main reasons to maintain secrecy concerning such teachings were to prevent wrong views, negative minds and the decline of faith concerning the teachings as well as to prevent argumentation and dispute. However, these days, it is difficult to maintain secrecy because so much information (correct and incorrect) is available in books and on the internet etc. The people who come to LamRim.com have a genuine interest for this knowledge. To keep it secret will not benefit the people seeking this knowledge at this time." Kirti Tsenshab Rinpoche was born in the province of Amdo (Eastern Tibet) in 1926, and at age six was recognized as the reincarnation of the former abbot of the Kirti Gompa. At the age of nine, He was ordained as a monk. Rinpoche received teachings from many high Lamas of the Tibetan Buddhist tradition. Lama Kirti Tsenshab Rinpoche is one of the holders of the tantra of Kalachakra lineage, having received that empowerment when he was 14 years old. At the age of 32 and having completed his monastic studies he was appointed as the Abbot of Kirti. After escaping from Tíbet in 1959, Kirti Tsenshab Rinpoche taught Tibetan orphans at the Tibetan Children's Village, Dharamsala, India. At the age of 45 he began a fifteen-year meditation retreat in a small stone hermitage above Dharamsala, "big enough for a bed, prostrations, and a stove". He spent seven years in meditation on Lam Rim, three years on "Seven Point Thought Transformation", and some generation and completion stage tantra. Two years were spent only on generation and completion stages and in the final 3 years, Rinpoche repeated all of the above. 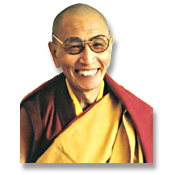 Rinpoche is one of the teachers of His Holiness the Dalai Lama and many other high Lamas. Rinpoche has been giving teachings around the world in many countries included: Australia, Germany, Holland, Hong Kong, Italy, New Zealand, Singapore, Taiwan, and the United States.